I'm continuing on in my re-read through the Anne of Green Gables series. Next up on my list was Anne of Ingleside , having finished Anne's House of Dreams back in November. I have thoroughly enjoyed reacquainting myself with adult Anne, but I think of the books which show her off as a maturing woman, Anne of Ingleside ranks as my current favorite. That is primarily due to the fact that I find myself at the same place and time as this Anne, being a mother with a houseful of children. Although Anne fades from the limelight in this book - a fact I've complained about in the past - this time around it makes perfect sense to me. Motherhood naturally decreases the focus on self and focus on children increases in the general scheme of things. I found during this reading that I didn't so much mind not hearing directly about Anne and her life as I have in times past. Instead I enjoyed getting to know her through the eyes of her children. You can still learn plenty about Anne, but knowledge comes naturally through her offspring as opposed to her own personal experiences. As Anne told Marilla once upon a time, “There's such a lot of different Annes in me. I sometimes think that is why I'm such a troublesome person. If I was just the one Anne it would be ever so much more comfortable, but then it wouldn't be half so interesting.” Reading Anne of Ingleside shows off Anne the mother and I found this makes her more than just "half" interesting. To my way of thinking, this view of Anne makes her more complex, and more complete as a character. We've loved and understood her as a child, and now we are able to know her as a wife and mother. 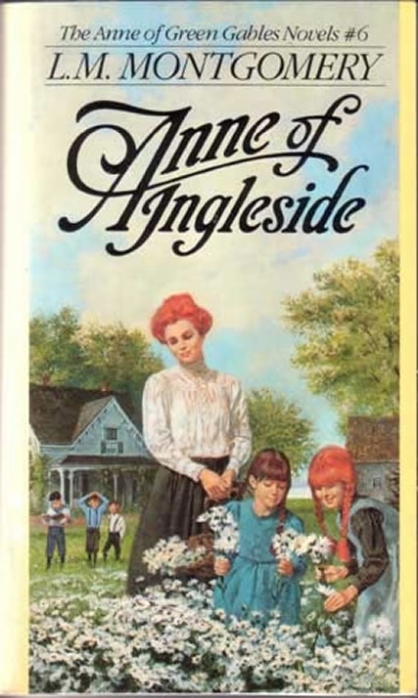 In case you are unfamiliar with the story of Anne of Ingleside , you should know that it picks up with the Blythe family who are living at their home which they have named Ingleside. Anne and Gilbert are parents to five boisterous (but lovable) children and are expecting their sixth. They deal with a gamut of real life adventures: interactions with relatives, guests who stay a little bit longer than they ought to have for comfort sake, childhood sicknesses and diseases, and day-to-day tasks which come of keeping house. Everything about this book held appeal for me at the present except the fact that Anne seems to make A Perfect Mother who always has time to listen and who always knows the perfect thing to say to everyone. I definitely lack that gift and I might be a bit tempted to hate Anne except that - ha! - that's just not possible. It is safe to assume that I enjoyed this title from start to finish but the thing I loved the very most were the concluding two chapters. I don't want to spoil it for anyone who might not have read this title already but I will say that the books ends with a tight focus on Anne and Gilbert's marriage. In these chapters we see her "realistically." She is weary from keeping up with general life. She and Gilbert are run down and overly busy. They discover that they still have things to work out in their relationship but they remain committed to each other and their future. It was good to see Anne endure a long day or two and have some misgivings about herself. It was good to "hear" her process her marriage, to see them fight and laugh and cry a little too. I don't think Montgomery could have ended this particular "chapter" of Anne's life in a more perfect manner. Some might say that Anne and Gilbert have an idealistic marriage and I can see the argument. However, I can also say that there are a lot of people in this world who know a hard day but are committing to sticking things out and finding ways to forgive and love and move along. Idealistic? I'd rather say that it's encouraging. No one's life is perfect, no matter what it might look like on the outside. Every marriage requires work and it's delightful to come across literary and real life characters who admit there's a struggle involved in the beauty of it all. 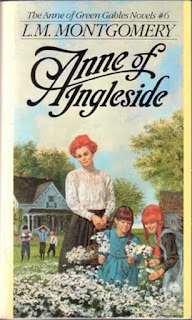 Anne of Ingleside was a great book for me to kick off my own reading during the Lucy Maud Montgomery Reading Challenge. If it's even remotely possible for me to have grown more in love with the character of Anne, I have done so. IF that's possible . . . I remember feeling the same with some of these books with an older Anne -- missing her a bit but enjoying seeing how she evened out as an adult. I love when authors show realism in relationships. I've got a ways to go. I'm only on Anne of Avonlea.